I wrote the blog article about 3 factors of whetstones’ quality last time, but today I will write this article about whetstones’ quality in detail. 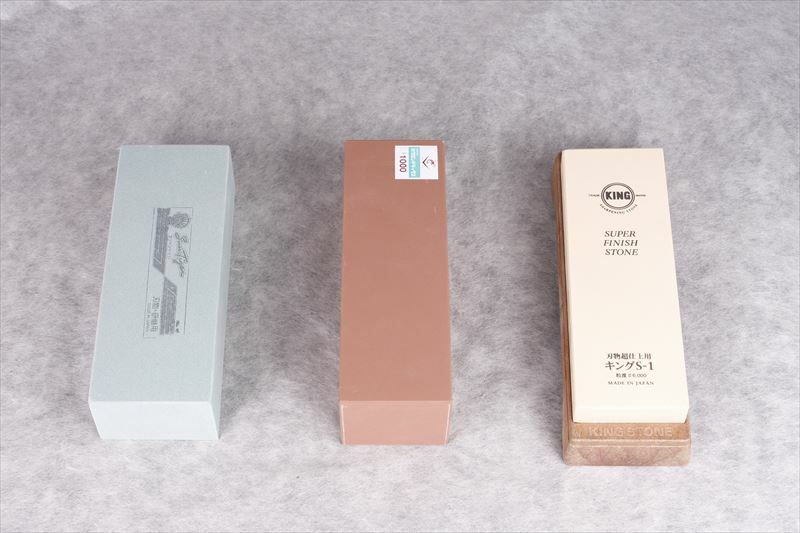 The whetstone’s industry in Japan says that whetstones’ quality is determined by 5 determinants. These 5 determinants are the ones into which the 3 factors of whetstones’ quality are resolved. Let me tell you the details. First, one of the 3 factors, abrasive grains is resolved into 3 determinants. Abrasive grains are briefly divided into 2 categories: the category of alumina and that of silicon carbide. I wrote this in detail in the previous article, so please let me omit this contents this time. This is the most common index we refer when we purchase whetstones. The larger the grain size number is, the smaller the grain size is. This means that when the grain size is larger, the whetstone is changed from a coarse-grit whetstone to a fine-grit whetstone. When the grain size is smaller, heat is generated more easily when the whetstone is used, although this does not happen as long as we sharpen knives by hand. The larger the grain size is, the brittler the whetstone is. This is the index that represents how much percentage the abrasive grains are included in a whetstone. The rate of abrasive grains is mainly 10% to 60% and the rank is subdivided from 0 to 25. However, in a whetstone’s industry, this rank is subdivided from 0 to 14 and the rate of abrasive grains is 30% to 60% in most cases. When the rate of abrasive grains is larger, the bonding power among abrasive grains is weaker on condition that the bond is the same and the amount of bond is the same. Then, we will feel the whetstone is soft because the whetstone is reduced more quickly. On the other hand, when the rate of abrasive grains is too small, the bonding power among abrasive grains is strong, so we will feel the whetstone is hard and a blade is not sharpened easily. Moreover, since the whetstone is hard, it is brittler. It is critically important to set an appropriate rate of abrasive grains to make a good whetstone. Second, the rest of 2 determinants are the ones into which “bond,” one of the 3 factors of whetstones’ quality, is resolved. The degree of coupling is the one that represents how strongly abrasive grains are maintained in a whetstone. This degree is subdivided into 26 types: A to Z. “A” means that the degree of coupling is weak and the whetstone is soft. “Z” means means that the degree of coupling is strong and the whetstone is hard. In other words, the more bond a whetstone has, the more strongly abrasive grains are maintained in a whetstone and then the harder the whetstone is. As a result, it is difficult for a whetstone to be reduced. The main types of bonds are those of vitrified, resinoid and magnesia. I wrote this in detail in the previous article, so please let me omit this contents this time. I wrote 2 articles this time and last time about whetstones in details. If you become more interested in sharpening knives, you would like to know whetstones more. I plan to write articles about natural whetstones in detail.